For the last two years of graduate school, I've rarely gotten the opportunity to read for pleasure. Grad school forces you to focus and re-align yourself often. Aside from academic books, I've found myself reading spiritual, emotional, life-balancing books every now and then. But mostly, this is an example of my usual reading life. This summer, I wanted to change that. I've decided to take the time to escape into someone else's world for a moment. When I do this, I generally don't go for dramatic books. Instead, I look for meaningful stories, enthralling characters, and rich details. 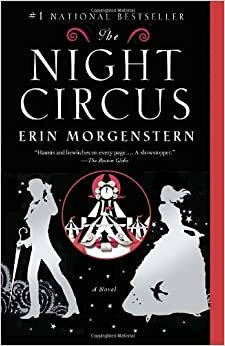 So far, I've read an exciting new book called The Night Circus by Erin Morgenstern, and I figured it's been a while since I've done a book review, so here goes! The Night Circus is a great read. I found myself connecting with Celia and Marco and the various characters in Le Cirque des Rêves so much. Plus, I enjoyed the descriptive details that Morgenstern employed because it allows the reader to indulge their senses. However, I couldn't get lost in the circus. There are pages and pages worth of descriptions in this book, but for whatever reason, I couldn't visualize the imagery for the most part. There is some sort of disconnect in the circus for me that I can't quite identify. There were other places, such as the first time Marco uses his gift of illusion on a young woman on the streets of London that I could definitely get lost in, but I never had that moment for the circus itself. Furthermore, the love story between Celia and Marco could have encompassed far more of the book. It should have been the centerpiece of the story, actually. Instead, we don't really get into their romance until the latter part of the book and it really doesn't matter until the end. Overall, I'd give it a 3.5/5. Also, I just finished re-reading The Giver by Lois Lowry. I read this back in 7th grade and I remember the emotions I felt while reading it (sad, confused, overwhelmed...yet I couldn't put it down) so I thought I'd try it once more as an adult. Plus, there's a movie about it coming out soon. Currently in my summer reading series, I'm reading The House on Mango Street, which I read in high school. I actually had the pleasure of hearing Sandra Cisneros speak about the book and get an autograph back in 2003 in Little Rock, AR. I don't think I understood how awesome that was until I became an adult. After that, I'm planning to read Gregory Macguire's Mirror, Mirror, per the recommendation of a fellow grad student. Plus, I've been inspired by my reading and I've written a couple of short stories that I may share here on my blog (first one here). What are you reading this summer? I'd love to hear about it! Hmm, that's interesting...I would've been more intrigued by the magic and somehow tying love into the story could be nice. That could be your next story? And you never really were a fan of the circus while growing up, so that may explain the disconnect there. Lol, I just can't believe that circus animals are treated right...I had a soft spot for animals even at a young age apparently lol. I'll look into the People Factor, could be a good read before school starts. Thanks Peej! I loved the night circus! And I just finished the goldfinch, which I would highly recommend. Now I've jumped on the game of thrones bandwagon-totally addictive! As far as non fiction I can't recommend both lean in and the confidence code enough. Both are fascinating reads about the struggles women have in their professional lives. Yes, Val! I've had Lean In on my list for ages and just haven't gotten around to it. I need to get on it!